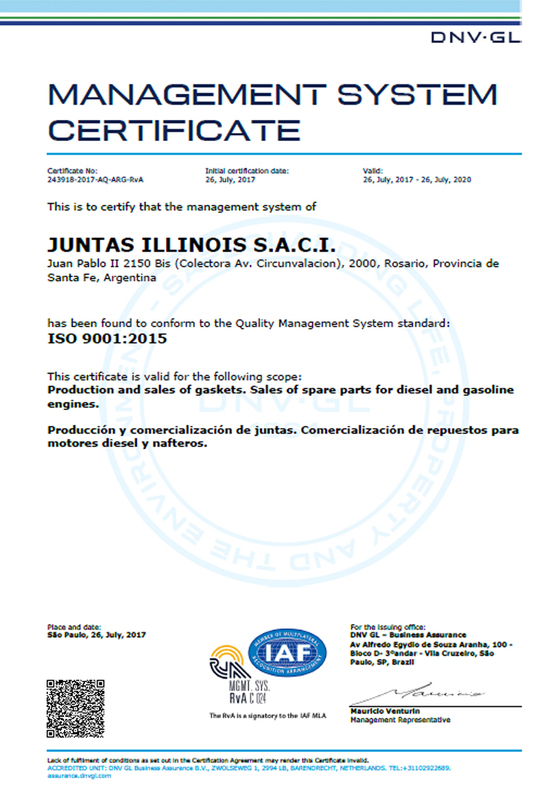 Juntas Illinois S. A. has implemented its Quality Management System, orienting the efforts to meet customer expectations in terms of products and services. To achieve these objectives, the company works focused on continuous improvement and constantly monitors the level of satisfaction throughout the entire Value Chain. To ensure the quality of products corresponds to customers’s requirements, the company has extended its own exigencies to their suppliers. TOP GRADE: Product tested according to the following international standards: SAE 921484, DIN 52913, ASTM F36 y ASTM F37. All production is realized under careful quality control throughout the entire manufacturing process. This product has the combination of last generation O.E.M. materials and maximum quality. Quality Management System ISO 9001:2008 (Nº 94012-AQ-ARG-RvA).